We are in the Algarve. 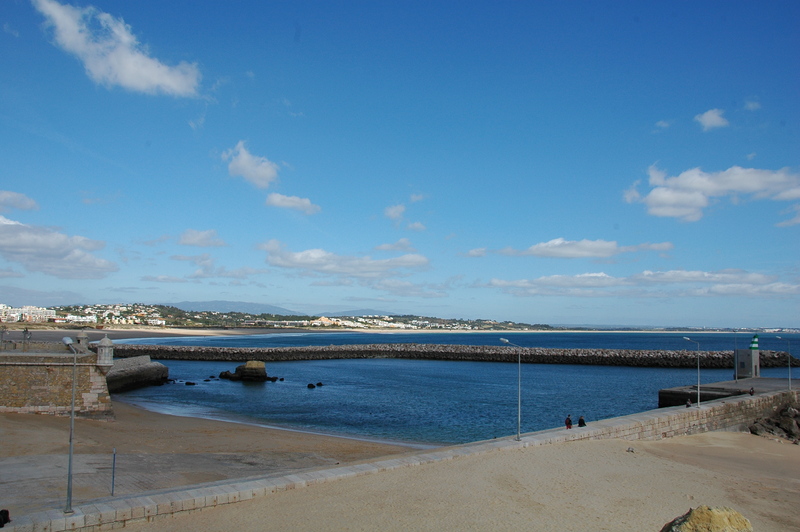 Today, our last day here we caught the free bus from Rocha Brava to Carvoeiro. It stopped at the beach, the Praia. We had lunch: chicken baguette for me, salad for Jan. Then we took the coastal path back. From Carvoeiro you can look back at Lagos. Today Lagos was shrouded in mist. 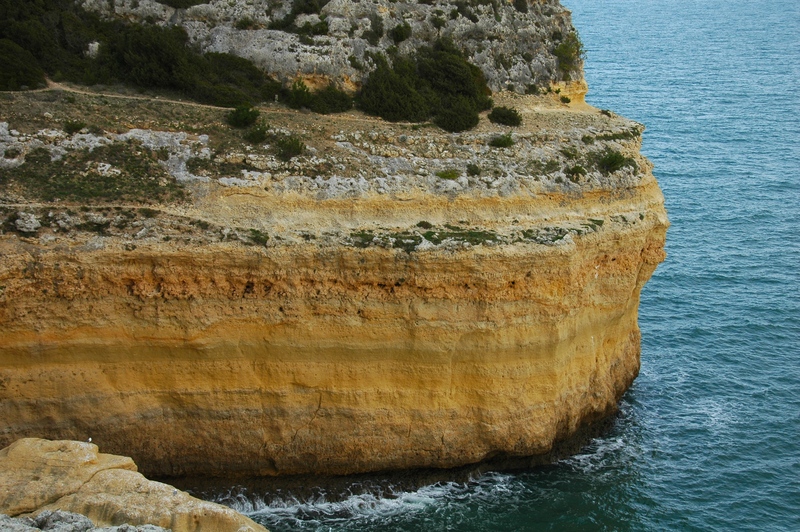 The cliffs are spectacular: in places histrionic in posture, architecture and color. In other places, flirtatious, with the sea as suitor and the wind jealous, very jealous. Up on the cliffs, the bare earth was not exactly red, not laterite but close. There are succulents and cacti everywhere, also aloes and mother-in-law’s tongue and in the undergrowth, thyme, wild thyme. We met very few people on our walk, young couples, middle-aged couples with teenage children, then the grey army of modern nomads evading the cold of northern climates for the warmth of southern ones. 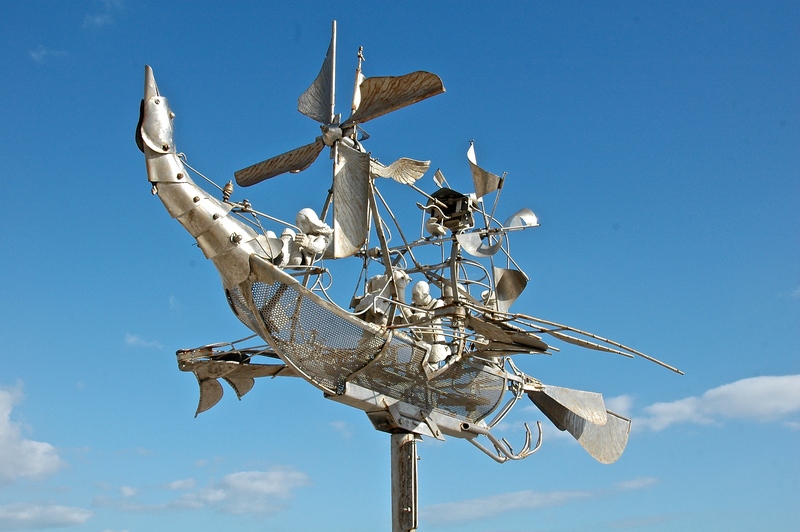 These nomads included English, German and Scandinavians, the occasional French and American. Yesterday our guide was called da Gama, like Vasco da Gama. He drove us in an electric vehicle from Rocha Brava to Alvor through Portimao. 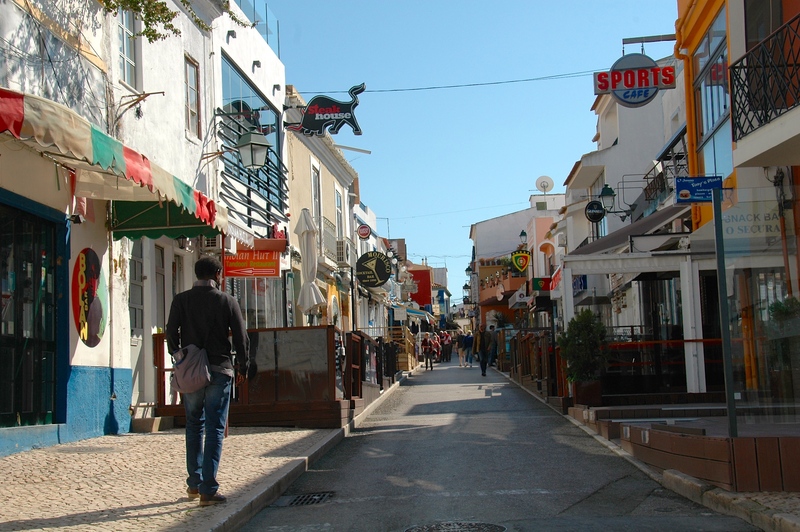 Alvor is a small town referred to as a village, just down the road from Lagos. It is squeezed into the narrowest valley you have ever seen. There is a boardwalk skirting the Atlantic. Out of season it is pleasant even if windy and exposed. For lunch I had grilled bream and Jan had grilled bass. The simplest meals are still the best. Our waiter and waitress were courteous and solicitous in approach. 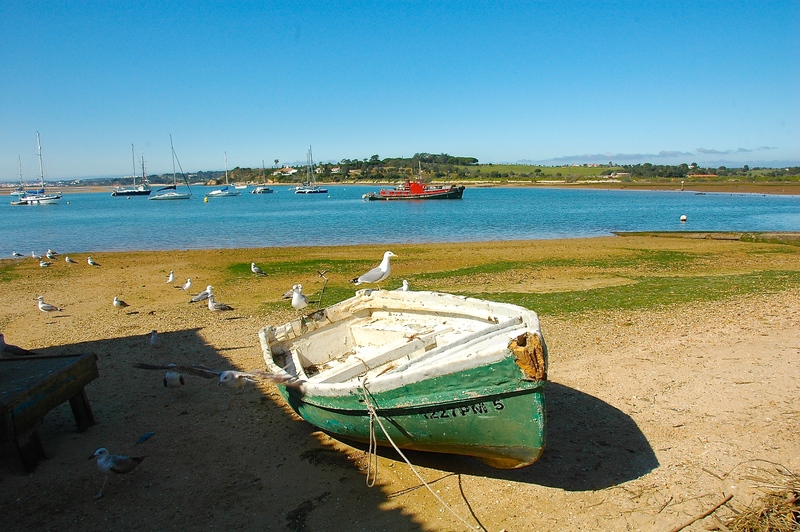 We came home through Ferragudo, that’s home to Jose Mourinho’s family, smaller than Alvor, but another fishermen’s village. You have sardine plants and their chimneys everywhere and the jetties too. Alas, sardines are now little in evidence. Tourism is the main trade. Storks have taken over the chimneys, each pair visible against the horizon. Apparently these birds no longer have the need to migrate to Africa in the winter. Now, Lagos! 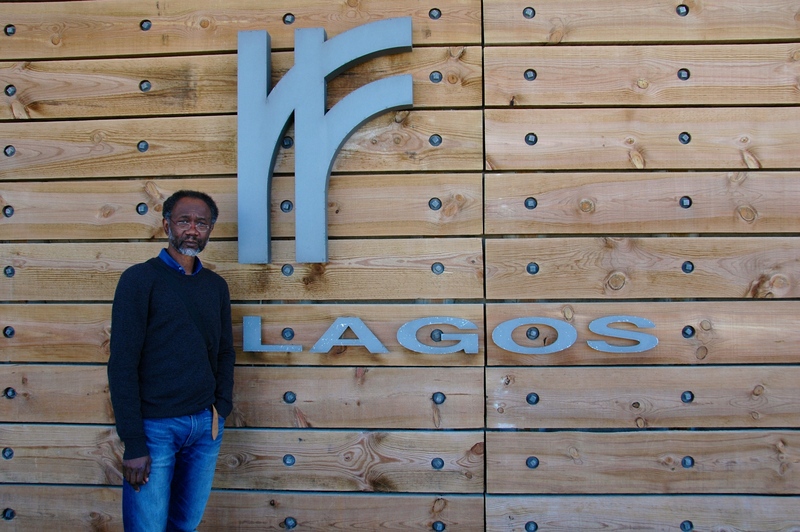 I was born in Lagos, Nigeria and it was strange to find myself in another Lagos, the original Lagos. It was somewhat like a native of York arriving in New York for the first time to be confronted by such a different city. It is much the same with Lagos, Algarve and New Lagos. 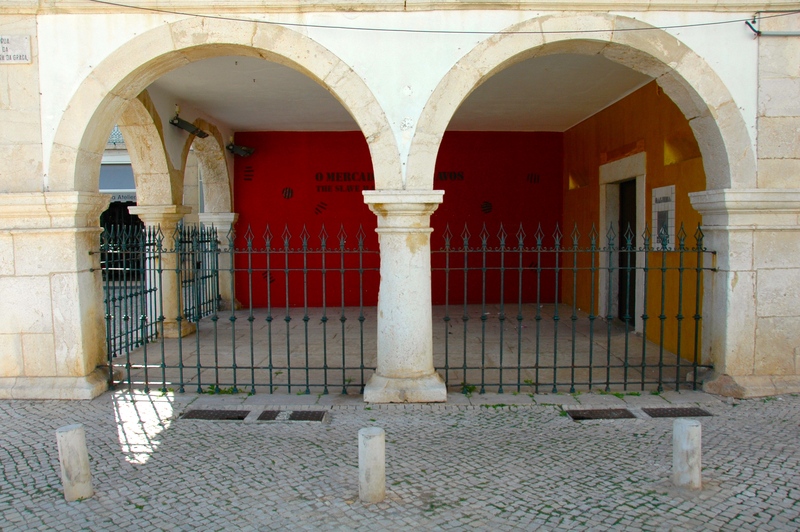 We caught a taxi from Rocha Brava to Silves and then a train from Silves to Lagos. 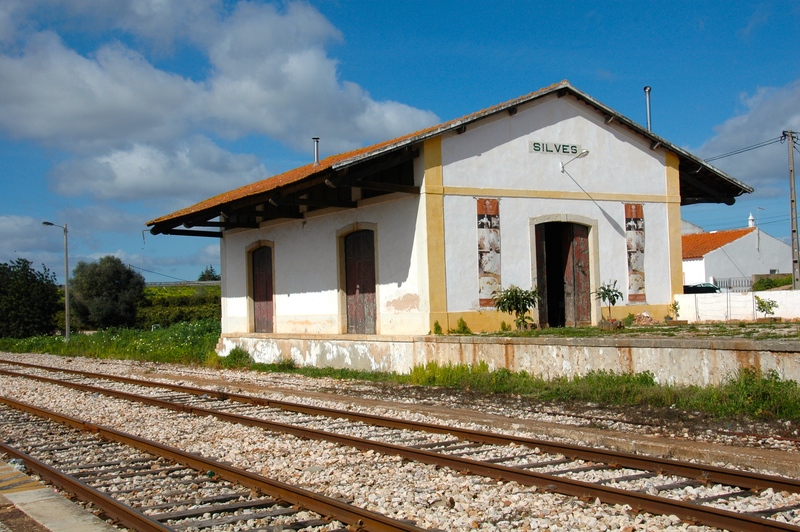 At Silves, we weren’t sure whether to walk across the tracks or not to catch the right train. I walked into an open building but a large black dog bounded towards me and I backed away. Then a man came out and invited us in to his studio, a sculptor. He was in his sixties, strongly built and very friendly, Antonio Villares Pires. He was most proud of a large canvas, The First Supper, inspired by Leonardo da Vinci’s Last Supper, except that this was of the twelve most important women in his life: his first and current wife, his daughters, his mother and two yet to be identified women. It was a study of facial expressions and of hand gestures. 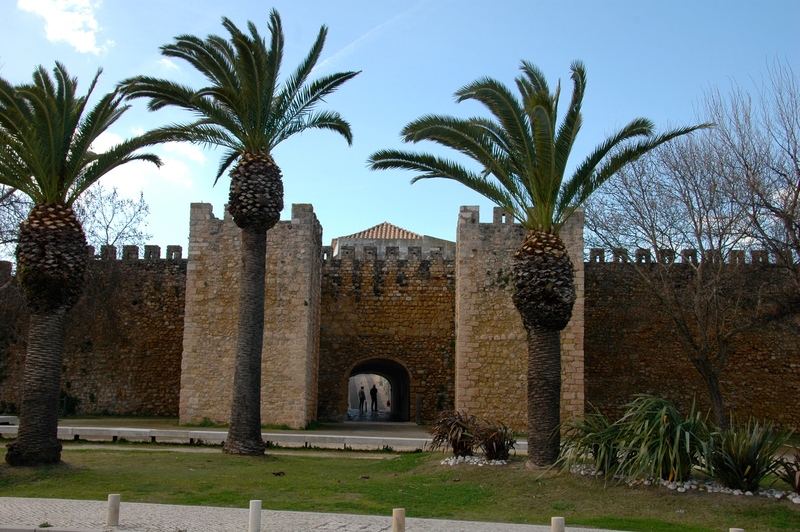 The large sculptures were drawn from Portuguese history, Peter the first and his son, etc. There was a shrine dedicated to his master, Dias. Antonio’s studio was called Temple of Time. An astonishing encounter! 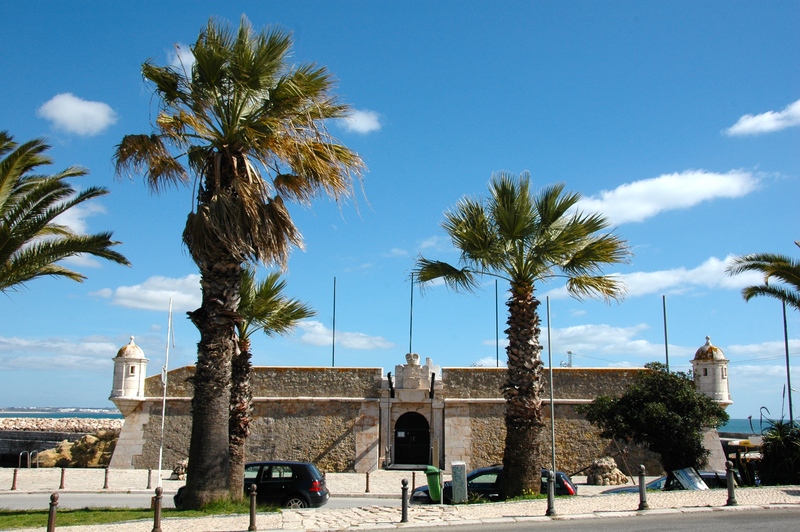 We arrived at Lagos terminus and walked along the marina to the fortress. In the sun, it was a warm day. In the shade, a cold wind turned the day into a cold one. From the fortress, the similarity to Lagos Nigeria was all too clear, a sweeping sandy beach ending in a lagoon. Just like New Lagos, the marina to one side, Apapa wharf to the other and in the distance the Atlantic and Lagos beach and Kuramo waters. 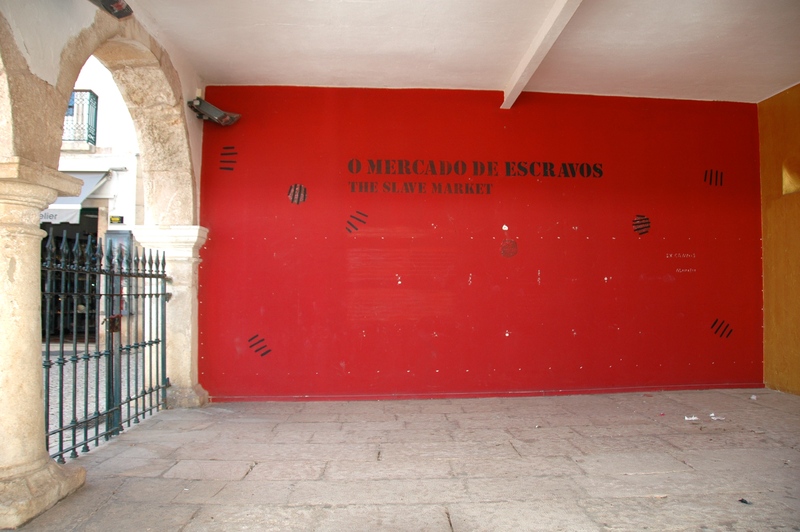 The main square has the slave market, Escravos Mercado, to one side. At least there isn’t such a market in New Lagos. You have to go some miles to Badagry to find connection to slavery. I can remember my first trip to Badagry along with Gboyega Ademola. We arrived in Badagry and picked up a 12/13 year old boy, an enthusiastic informal tourist guide, versed in the local history. I have been back to Badagry several times since but that first trip is still by far the best of them all. Something to do with the freshness and earnestness of our young guide made it a special day. That is nearly 40 years ago and our guide must himself be a father now. The shackles, the various implements of captivity on display truly reminded us of the nature of slavery and the pain and extraordinary anguish that the slaves must have experienced in those last few moments before forced departure to the Americas. This was a most gruesome part of our history. 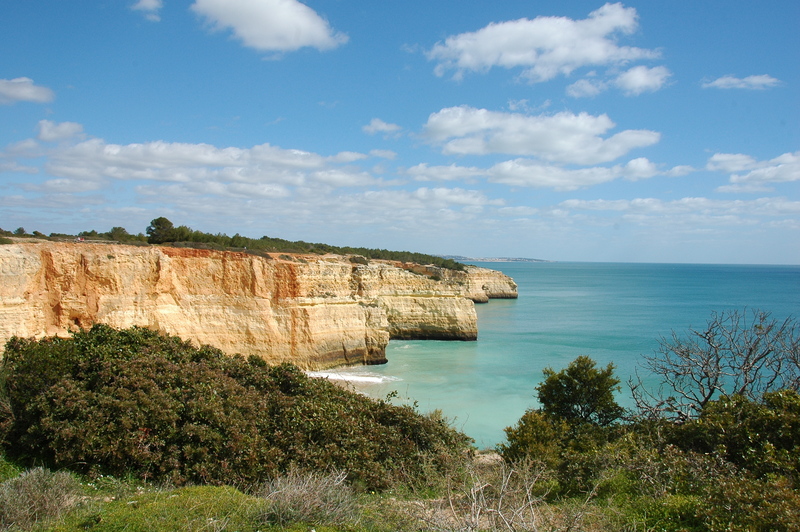 The Algarve this late winter has been absolutely what we hoped for. We overlooked cypresses, cedars, olives and palms. The sea was just visible in the aperture that trained the eye to a focal greyish blue point. 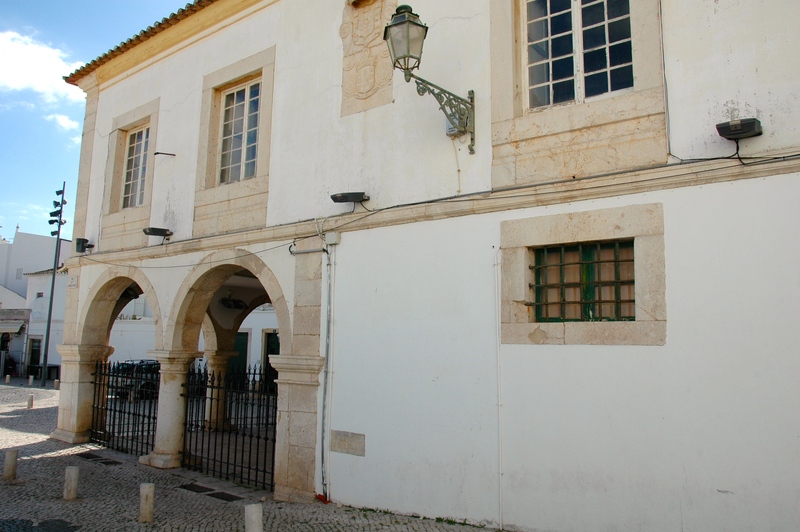 We are staying in Rocha Brava. 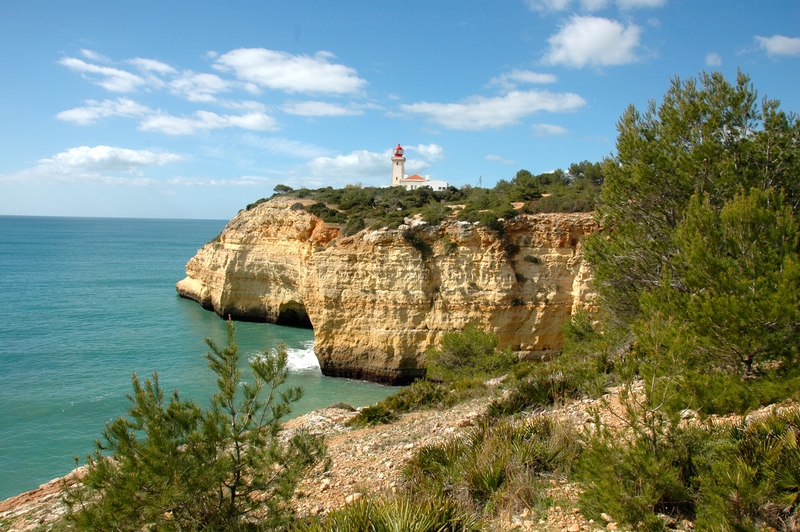 It is an adobe white village climbing inland from the cliffs. We are staying in what I suppose is a townhouse: our bedrooms and bathroom downstairs and our living room and kitchen on the first floor. Driving in from Faro the cherry blossoms were already out and this was only February. Oleander was all but still dead, mimosa and hibiscus are also in bloom, well not exactly, but not dead. 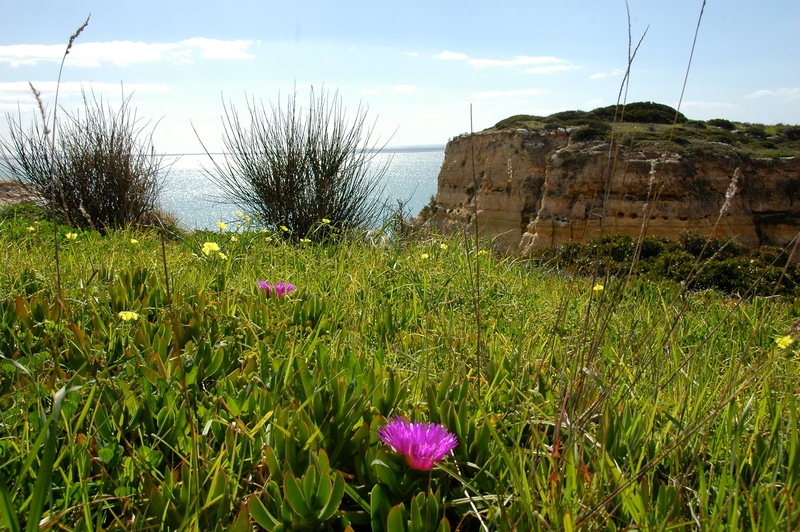 The coastal walk from Alfanzina lighthouse to Benagil beach was not quick. A mere 3 miles, yet it took over two hours. The start was marked by a clump of lantana. And that evoked the predictable memory of crushing of lantana leaves in my childhood and smelling that peculiarly youthful fragrance of oils and vapor. The lighthouse itself had a red dome, a Moorish minaret with a terminal pike. 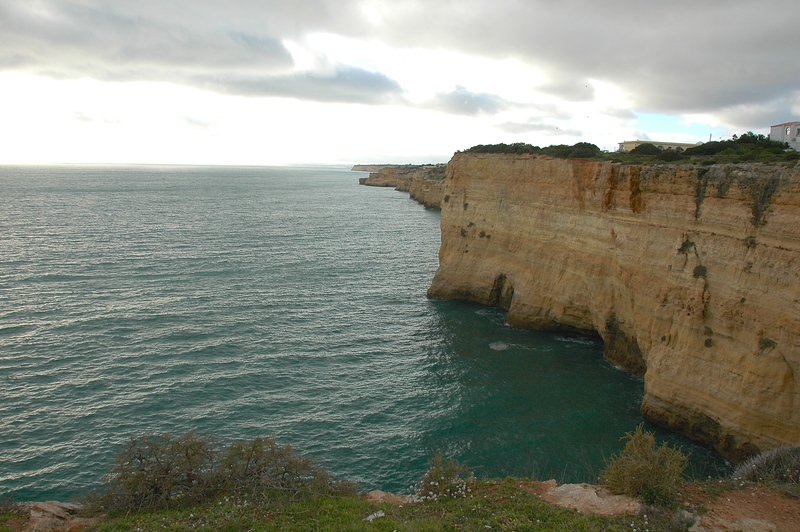 The walk was on high cliffs, calcareous cliffs with many visible sink- holes, natural wells and sea stacks. Even when you couldn’t see the bottom of the wells, you could hear the sea far down below hitting the sides with a whoosh and plash, sucking the curiosity down the well. It reminded me of the well behind my uncle Zacchaeus’ house. My grandmother Elizabeth didn’t have one behind her house. Her water came from a stream and was then cooled in recess in her bedroom. I recall being taught how to draw water from that well. You let the bucket down in such a way that it fell on its side to allow some water in. Then you tugged at the rope and let the half filled bucket back in with a thump and filled the bucket full. The trick now was how to pull the full bucket back up without bumping against the well wall and losing all the water before the bucket was back up. I somehow never managed that! On such occasions I wished I hadn’t been born in the city without the requisite skill of drawing water from a well. In Lagos all you needed was the ‘no skill’ of turning a tap on. Occasionally you had to strike hard at a standing pipe, but that was it. This is the Atlantic Coast. The ocean stretches out in a bow, a fine and wide line in the horizon. Smuggler’s cove is at the bottom of paved steps. The cliff behind is a wonderful curve, an amphitheatre facing the sea. The sand is brownish yellow, with the sun on it would be golden. From Smuggler’s cove we were aiming now for Benagil beach, where we stopped for an espresso and ice cream. We sat in the blaring sun, full volume on. Then after a while went round to the beach where a handful of elderly couples are sunbathing. We seek out the barest sliver of shade and I perch on a stone, Jan on the sand and we have our picnic lunch. These weathered and over exposed skins in the sun, not brown or pink, but pale and grey are not the best adverts for sunbathing! I have all the hard held prejudices of the African against sunbathing, against the brutal heat of the midday sun, against the indolence of lying barely clad in the sun. 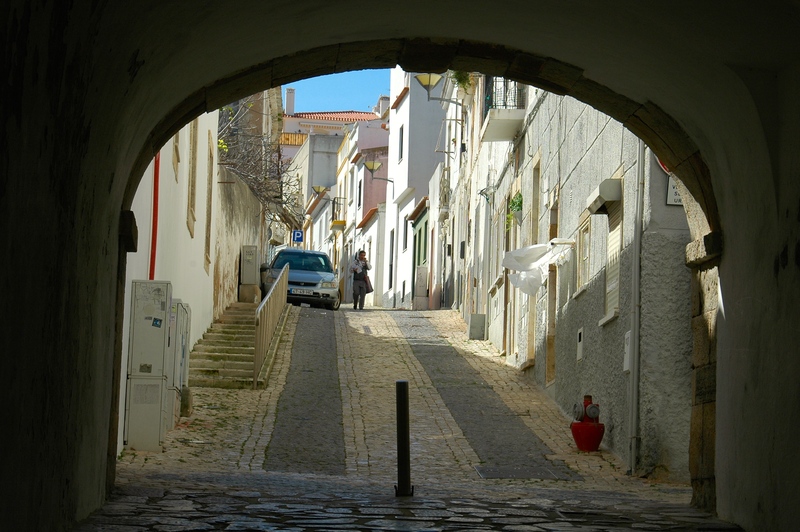 The walk back to Rocha Brava was on the main road. Past orchards of almonds just coming into flower, daisies and daisies, raffia palms, we trudged like weary travellers, well we were weary but hardly travellers. Thanks for the beautiful post about Lagos. 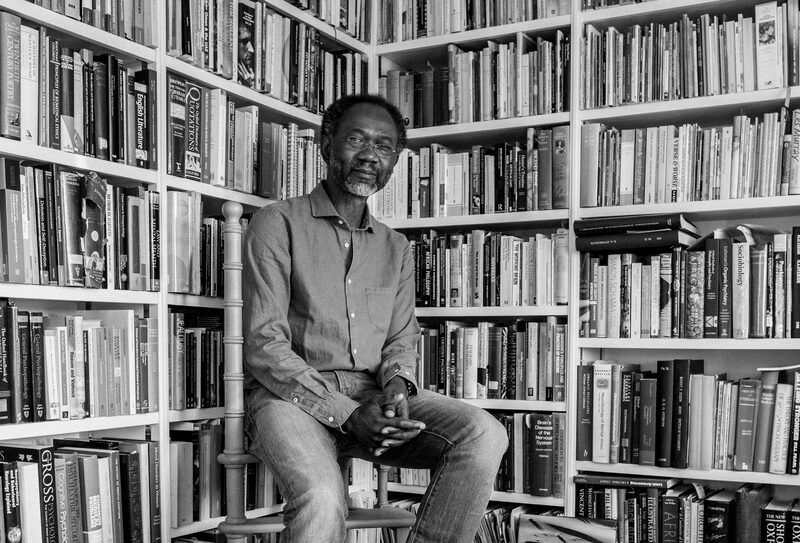 Femi this is very nice indeed. I had some expertise with the bucket in the well. Jan’s pictures are beautiful. ?very enjoyable piece. Thank you.